Burmester 100 Phono Preamplifier review | What Hi-Fi? 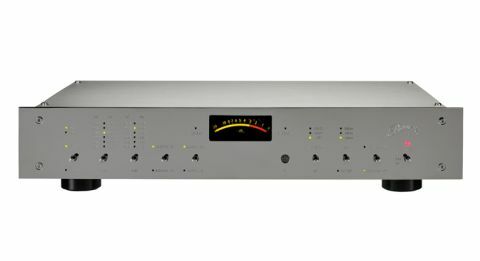 If you’re after the best phono stage money can buy, this Burmester needs to be on your list. There are plenty of choices at ‘money no object’ levels, but few can match the 100 Phono’s modular nature, feature list or sumptuous build. The base version of this unit comes in at the price we’ve quoted. This can support a single turntable (with either a moving magnet or moving coil module) and pass the amplified signal through single-ended or balanced XLR outputs. If you’re lucky enough to run two turntables, the 100 can be equipped with a second phono module – both MM and MC options come in at £1640 each. Switching between the two inputs is but a toggle switch away, and each can be optimised individually thanks to wide-ranging gain and impedance adjustments. There is also the option to add an analogue-to-digital converter into the mix. Why would you want to? It lets you digitise and archive your vinyl, which is handy. Specifying the digital module adds another £1240 to your bill. Our review sample has two phono modules (one MM, the other MC) but not the analogue-to-digital circuit (sadly). The 100’s front panel is pretty busy, but the signal level meter grabs our attention. This can be selected to show the output of each channel individually or mixed together. It’s not totally accurate – there’s the inertia of the pointer and mechanism to consider – but it's handy to optimise performance as well as set the recording level for the digital recordings (if you have the A/D module fitted). Go too high with the gain setting and the distortion is obvious. If the level is too low, noise can become an issue and dynamic range suffers. Elsewhere there are more (rather lovely) toggle switches for most of the settings. There’s pretty much every feature we can reasonably ask for here, including load impedance, a dedicated gain level for each input (37-52dB for MM and 57-72dB for moving coils), a subsonic filter (to take out unwanted low-end rumble) and switchable output level (variable or fixed). The ability to deliver variable output means that the 100 can be connected directly into a power amp and bypass the need for a dedicated preamp in a purist vinyl-only set-up. This shorter signal path also promises greater transparency. The phono stage even comes with a chunky metal system remote to control the volume in such a set-up. There’s also a rather novel feature that ensures the cartridge’s channel balance is, well… balanced. This can even things out to an accuracy of 0.2dB and can correct differences of up to 6dB between left and right channels. The company even provides a test record to ensure an accurate setting. But Burmester hasn’t stopped there. If you’ve specified the digital module, you can choose sampling rates of 48, 96 or 192kHz to record in. This lets you balance performance with file-size better. Our only issue on the feature front is Burmester doesn’t give the user a choice of equalisation curves. Let us explain. Most early discs were recorded using equalisation curves particular to the company that made it. There was no overall standard until the current RIAA curve was established in the mid-1950s. This curve has been used on the vast majority of recordings ever since. Why does having a choice of equalisation matter? If you have a lot of very early records, the only way to hear them at their best is by using the appropriate equalisation curve with them. Some of Burmester’s rivals offer this choice. It’s important to note the 100 still works with these recordings, it’s just the overall presentation won’t be optimal. Build quality is as good as we’ve come to expect from Burmester – the company’s products are invariably expensive but, in our experience, always have the construction (and generally the performance) to justify the high cost. The 100 Phono simply reinforces our positive impression. Its casework is rigid and immaculately crafted, with crisp edges and beautifully finished panels. Some may not take to the superbly chromed fascia, but we like it. Perhaps surprisingly, it helps the product to blend into our room by reflecting its surroundings. Take the lid off and you’ll find the quality extends to the inside. The circuits are neatly arranged, with the 100 Phono’s modular nature obvious. The power supply section is generously specified and there’s no missing the high grade of components used. Of course we expect to find such quality at this level but, even so, that’s not always the case. The Burmester runs a little warm during use, so it makes sense to house it in a support with decent ventilation. Electronics tend to be sensitive to vibration and resonance, so make sure the support is suitably isolating too. It makes no sense to spend this much on a phono stage without a really capable system around it. We use our Clearaudio Innovation Wood with Stradivari V2 moving coil cartridge and VPI’s Prime Signature/Lyra Delos as our main sources. We also try a Rega Planar 3/Elys 2 combination to test out the moving magnet stage. The rest of the system comprises Gamut’s D3i/D200i pre/power amplification and ATC’s evergreen SCM50s. After letting the Burmester settle over a few days we start with Nick Cave & The Bad Seeds’ The Boatman’s Call. We use this record a lot in our reviews, but through the 100 Phono we hear fresh inflections in Cave’s characteristically coarse but emotion-packed vocals, and layers of extra texture on the backing instrumentation. There is so much space around the voice and instruments – a lack of clutter and the freedom to breathe gives every sound free rein to ebb and flow. We appreciate the low noise floor too. This is a really quiet phono stage that adds very little hiss to the sound, even on its higher gain settings. This characteristic points to well-designed and isolated circuits and aids the way the 100 reproduces dynamics, particularly at low signal levels. Things are surefooted rhythmically, as a spin of Radiohead’s In Rainbows shows. There’s plenty of punch and attack here, but it’s wrapped in the warm embrace of Burmester’s trademark refinement. There’s never a hint of unwarranted harshness in the sound, yet little of the music’s excitement is lost. It’s a neat balance few rival manufacturers manage. Tonally, as is the company’s way, the top-end is sweet and there’s a hint of excess richness through the midrange and bass. But it’s never taken so far as to annoy, and simply results in the phono stage rendering aggressive recordings a little bit more palatable. That’s just fine with us. Beethoven’s Fifth Symphony shows off the 100’s impressive scale and low-end authority. The Burmester produces a huge soundstage, and packs it with precisely focused and layered instrumentation. This unit has sufficient resolution to make it easy to follow the various instrumental strands, and enough cohesion to keep this dramatic piece’s emotional impact intact. There’s plenty of low-end weight, and it’s coupled to an impressive degree of agility and tunefulness. Large dynamic shifts are delivered with confidence and force, while smaller changes are rendered with the finesse they deserve. Just for fun we compare the 100 Phono to our current reference, the £2500 Cyrus Phono Signature/PSX-R2 combo. We’re big fans of the Cyrus and prefer it to every price rival, but compared to the (obviously far pricier) Burmester it sounds quite flat, cluttered and mechanical. This is a measure of just how good the 100 Phono is, rather than any slight on the great-value Cyrus. For those with deep enough wallets and a suitably talented partnering system, there are few downsides here. If you have lots of very old records the lack of choice in equalisation may be an issue, but for everyone else it won’t matter. This is a beautifully made and engineered product that sounds lovely. We want one.